It was rumored that an insane woman had lived and died there. It's said that she murdered her family and then treated the bodies as if they were still alive. They also claimed it may have been an insane asylum at one point in it's history, where atrocities of "science" were used to try to cure the patients, and most of them died. Once, a child of 10 was thought to have been seen in an upstairs window, but no one was brave enough to go in and see if it was real. 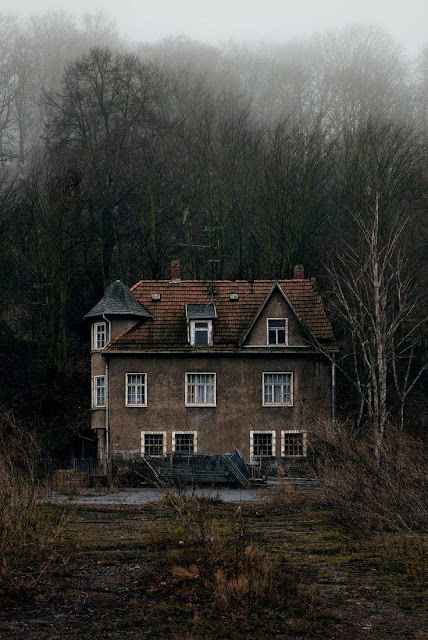 The local township wanted to demolish the home, but they were too terrified of the curse they feared they would unleash. The Home was never put on the market, they knew nobody would buy it. They put up warnings and fenced the property off in hopes of keeping the stray traveler away from it. But it never failed. At least once a year, some stranger from the city would find their way into town, decide to go sightseeing, and no matter how many townspeople told them to stay away from that end of the community, the traveler would undoubtedly head in that direction, never to be heard from again. Then one day a nondescript man showed up in town. He meandered his way around the local district, listened to the warnings and headed in the direction of The Forbidden Home. The locals shook their heads and went about their day, positive that they would never see him again. Suddenly, the sky turned pitch black and there was an unholy scream in the air. The families of the community quaked in fear, and stared in the direction from which the screams came. They saw a red glow hovering over the horizon, above where the Home was located. They ran to their homes, or the nearest building, in hopes that whatever was happening would pass them by. The screams continued for hours, some of the inhabitants of the town were seen leaving their safe harbor and heading in the direction of the Home. Nothing their friends and neighbors did could stop them. Eventually dawn broke, and with it came silence. The screaming stopped, the red glow took on a more subdued, hazy shade and about ninety percent of the townspeople were no where to be seen. Those that remained hesitantly exited their homes, and huddled together in confusion. Out of the morning mist, from the direction of the Home, they saw a lone figure walking down the road. The nondescript stranger looked a little worse for wear, as his appearance was such that he appeared to have been in a battle. As he passed the huddled mass of humanity, he turned to them and with gleaming eyes said, "The Forbidden Home is no more. The demons that lived here are no more. And if you wish to survive this night, you should burn this entire town, the woods and all property owned by this township. Because they will come looking for me, but will only find you. The fire will muddy the trail, and give you and your families a chance to flee to a more normal life. If you don't leave, you'll either die, or become demons yourselves. Your choice." And with that eerie proclamation, he vanished. Did the townspeople listen? If you follow a lone road back til it dead ends in a burned patch of earth the size of a small town, you may or may not find a friendly face to give you a tour of the area and tell you the story. But if you do make such a trip, be sure your affairs are in order, because you just never know what might happen.